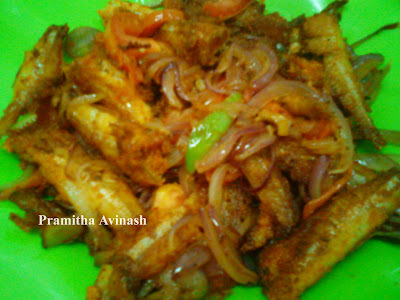 1.Prepare the marinade using number 2 ingredients and apply it on the anchovies and keep it in the fridge for ½ an hour. 2.Heat oil in a pan and fry the anchovies on both sides on medium heat until it turns brown and keep it aside. 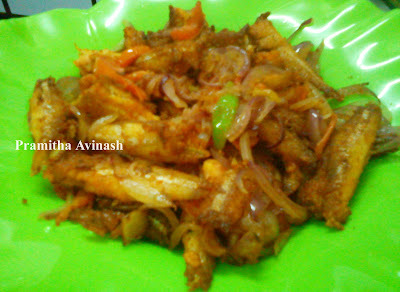 3.In the same pan,if there is any oil left that is enough otherwise add 2tbs of oil and saute the sliced onion, green chilli,curry leaves and little salt,when it gets sauted add the sliced tomato and saute it for 2 mins then turn off the heat and add the fried anchovies and mix altogether. 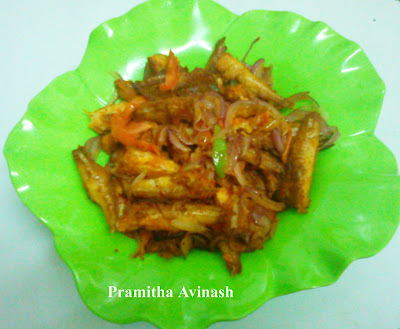 Serve this crispy anchovies fry/netholi porichathu with rice….